Visiting the Louvre Museum in Paris? Want to know about guided tours at the Louvre? We’ve got information about Louvre guided tours, opening times & tickets here. The Louvre Museum in Paris is one of the most famous museums in the world and home to an incredibly vast collection of art from various civilizations spanning thousands of years. If you’re not an art aficionado but nevertheless interested in art and want to get a deeper understanding of the art on display at the Louvre Museum, then it’s highly recommended that you take one of the guided tours on offer at the museum. Guided tours of the Louvre Museum are available in English daily. The tour last 90 minutes and takes you through some of the most famous pieces of artwork on display at the Louvre. Guided tours in English are available between 3 to 5 times a day depending on seasonal demand. 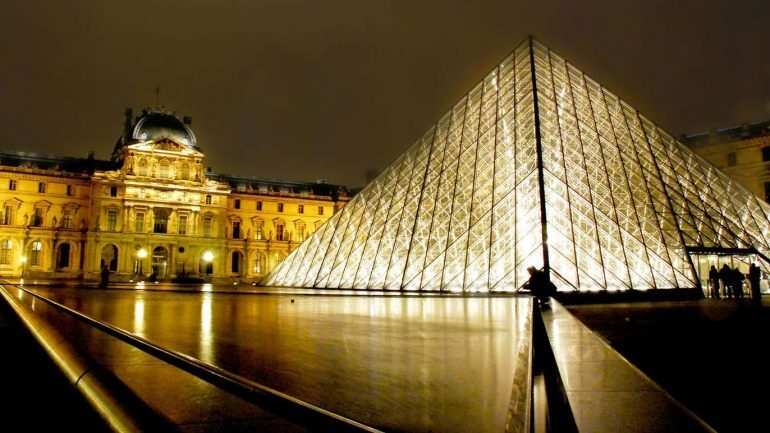 Guided tours of the Louvre begin underneath the famous glass pyramid (designed by American architect Im Pei) located in the centre of the museum. Although there is a fee incurred for participating in the guided tour children under the age of 13 go free, while those under the age of 18 receive a discount. Guided tours of the Louvre are limited to 30 people and places are allocated ona first come first serve basis, so it’s advisable to turn up to the glass pyramid 30 minutes before the tour commences in order to register your names. The Louvre museum also has an audio guide available in six languages which takes you through more or less the same pieces of art work that you’d see with the human tour guide. Audio guides last 90 minutes and can be rented from a desk near the information desk at the front of the museum. The Louvre Museum is closed on Tuesdays and Public holidays. From Wednesday to Monday the Louvre Museum is open from 9am until 6pm. On Mondays, some wings of the Louvre remain open until 9.45pm. Tickets stop going on sale 45 minutes before closing time, and museum guards will begin clearing many of the halls 30 minutes before closing time. Standard tickets enable you to enter the museum as many times as you like within one day, enabling you to leave for lunch or to rest in the middle of the day. Standard tickets enable you to see all permanent exhibits; however, temporary exhibits incur an extra fee. Entrance is free for all at the Louvre Museum on the first Sunday of every month. If you intend to visit a few museums while in Paris, why not consider investing in a Paris museum pass that gives you entry to more than 70 museums and monuments across the city.